2019 Convention – Registration is open. 35th Annual MAMCOAANA Convention will be held from July 25-28th, 2019 at Swissotel Chicago. Registration is now open. It is turning out to be a family oriented get together with lots of activities and learning – CME (8 credits) – Advances in Medicine 2019. MAMC Alumni are putting their time and effort towards making this an insightful and innovative CME. In addition we have faculty from LHMC Alumni. I am thankful to all the CME speakers for their commitment to MAMCOAANA. Life members get discounted rates. For registration and hotel booking please visit the Convention details page. Gala Dinner will be held at Swissotel, Chicago on July 27th, 2019 – 6pm. Tickets are available at the registration page. Feel free to email me if there are any questions. I am pleased to announce that Discounted Life Membership Drive is on now. This is a great opportunity for our Alumni who have been thinking about it but have been undecided. 50% discount towards life membership will end on Dec 31, 2018. Being a life member gives you a never ending discount towards the Annual Meeting and a voice in the future of the Alumni Association. Add Life Membership to your cart now! The 2018 MAMCOAANA Convention was a big success thanks to great efforts by Dr Sonali and Dr Vivek Mishra. They have given us a great experience and Dr Bharti Khurana conducted an incredible CME Meeting. I will never forget these moments of learning, joy and celebration with my Classmates -some of whom I met after 24 years. I am sure all participants share these feelings. What a great event for networking! Our Annual meeting with the Alumni is something special. Days and nights spent at MAMC (1989 -1994) created friendships that have become strong and lasted a lifetime. Besides renewing the past bonds – I find that we make new friends and discover fresh connections with our Alumni. My wife Manjari Gambhir graduated from LHMC in 1996. With us attending MAMCOAANA she has also renewed old friendships and made new contacts with Hardinge Alumni. We are delighted to invite LHMC Alumni to attend next year’s meeting as well. The World is really a small place as long as we are willing to open our arms and get to know each other. I feel that in all of us there is a perpetual longing to reunite with our roots. MAMCOAANA is becoming a steadily growing family that welcomes new members every year. I encourage young graduates as well as those who have been on the fence to become life members this year. 35th ANNUAL MAMCOAANA CONVENTION 2019. Dates – Thursday July 25 to Sunday July 28, 2019. We are in the process of creating a great program (includes Family fun time at the Beach, Musical Evening, Gupshup, Shayari, Tennis Tournament, Gala dinner). Get ready to have a blast. Save the dates and make travel plans to Chicago – July 25 to 28th, 2019. Become a Life Member Today! To access this post, you must purchase Annual Membership or Life Membership. Check out the drop down menu for ‘Sandesh’ on the home page for submissions for Sandesh – stories, anecdotes, experiences, poems, memories of MAMC and MAMCOAANA and everything in between is welcome for consideration! Our 2018 CME Convention is fully sold out, but tickets to the Saturday Dinner are still available. See you soon! Dear friends, the registration for the the 34th annual convention to be held in Chicago is now open. We have an engaging agenda for you which includes, CME in the morning of Friday and Saturday from 8am-12 noon, by our very own alumni. Evenings will be busy with fun and entertainment on all 3 days. On Thursday we will have an open karaoke mike and “Meet and Greet.” On Friday we will have a “Boat cruise in Lake Michigan” with Indian food and Bollywood DJ. On Saturday we will have the main dinner with Bollywood DJ. So pack your bags and get ready for some fun. Next year it will be the Silver jubilee celebration of 1989 joining batch and the Golden Jubilee celebration of 1968 joining batch. I would encourage the Maulanians from these two batches to honor us with their presence. You can register online and pay online, or can download the paper form and mail it to us along with the check. Whichever way you like, we would like to see you in Chicago. Hotel accommodation is at a discounted price at the venue, Hyatt Centric at Magnificent Mile, 633N St Clair St., Chicago. Please register through the website, as it has a link to hotel registration. 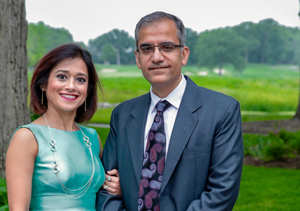 Dr. Nitin Shah , M.D, a graduate of Baroda Medical College, is a physician practicing in the US. He has been active in holding doing various medical camps in India, mainly in Gujrat. His next camp is in Surat, January 2nd to January 13th, 2018. Anyone interested in volunteering, please contact Dr. Vivek Mishra. Some of our MAMCOAANA leadership, including Dr Bhushan Pandya and Dr Randeep Suneja, have already signed up for it. During the recently concluded MAMCOAANA meeting, the GBM ( General Body Meeting ) had decided to explore such mission work in th future. With Dr Shah’s help we hope to start a new chapter in the MAMCOAANA family.